Material: 95% cotton,5% spandex; This cotton dress for women is stretchy, soft and comfortable. This fall autumn/winter dress is suitable for various occasions like Casual, Cocktail, Party, Wedding, Work, Events, Holidays like Halloween & Chrismas, Outgoing, Dating and so on. This dress is with striped patchwork & pockets design, which makes you eye-getting ladies. [ US regular size S ] Bust: 33.85"-36.22"; Sleeve length: 23.22"; Dress length: 36.22"
[ US regular size M ] Bust: 36.22"-38.58"; Sleeve length: 23.62"; Dress length: 37.01"
[ US regular size L ] Bust: 38.58"-40.94"; Sleeve length: 24.02"; Dress length: 37.8"
[ US regular size XL ] Bust: 41.73"-44.10"; Sleeve length: 24.41"; Dress length: 38.58"
Sizing Error: please allow 0.4inch difference due to manual measurement. Monitors Color Error: due to the light and different computer monitors, the color may be slightly different from the pictures. Products and Customer Services: our company concentrates on women's fashion and dedicates to provide high quality products and good customer service. 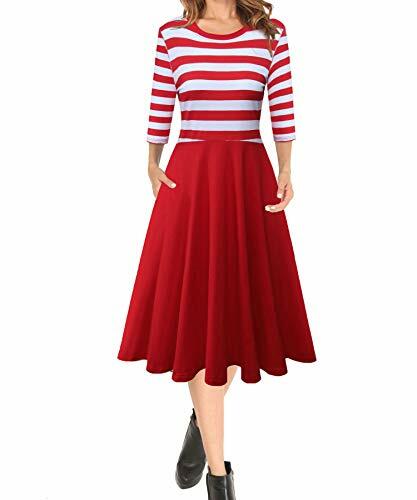 Features: Striped top, 3/4 sleeve, A-line, Pockets Designed, Knee length, Casual and Fashion. Stripes Patchwork, Very Good for Where's Waldo Costume & Bee Costume This dress is perfect for: Halloween, Chrismas, Outdoor, Wedding, Cocktail, Party, Work or Casual use. Wash tips: hand washing/machine washing with cold water; Don't bleach. Please read the size description carefully to choose the right size.